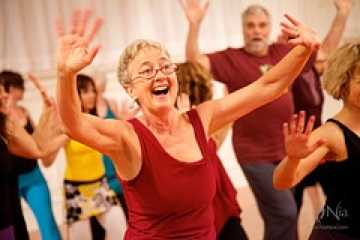 Want to try something energising, joyous, strengthening, moving and relaxing all in one session? Welcome to the Nia (Pronounced Knee-a) Technique. Hi I'm Vicki and it is my greatest pleasure to share and guide you as we dance and move to soulful and inspiring world music. Blending joyous East meets West modalities, Nia brings great variety to body/brain connected movement. More than a dance class and more than an exercise class, Nia is uplifting and empowering, so gentle on the joints we dance barefoot. The program is easy to pick up with no previous experience required. Suitable to most fitness levels, body types, ages and genders, Nia is highly adaptable so all are welcomed. Our goal is to find your bodies way in movement, improve motor skills, strengthen, and gain the sense of feeling great and having fun with no right or wrong to worry about. Sound good? Please feel free to connect with me for more or to discuss. Great news we have added a morning class! I look forward to welcoming you to the Nia experience and dancing with you soon. sorry I cannot find the price for a class?